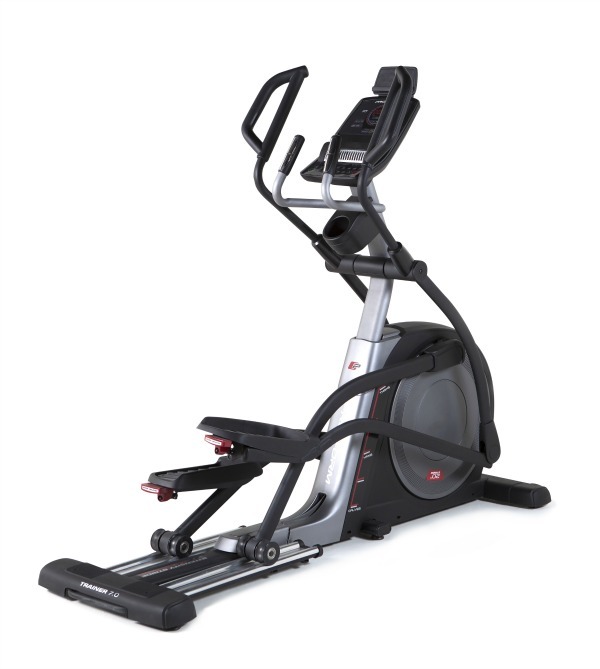 Kettler are renowned for Elliptical machines that boast high quality German design and engineering at a premium price point. 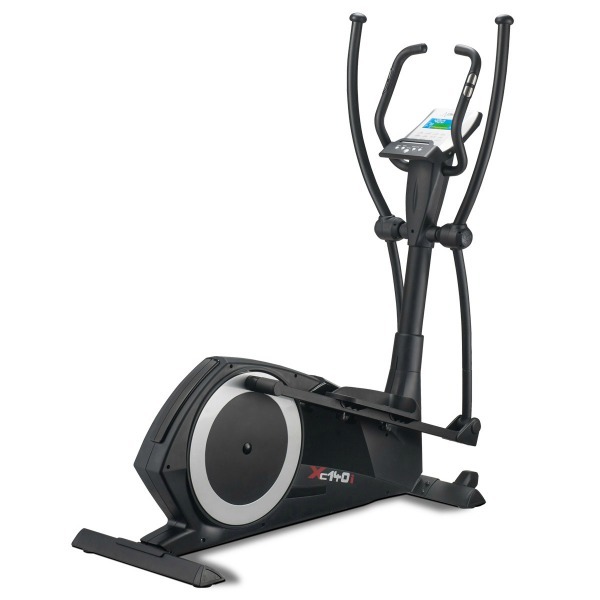 The Kettler Unix E Ergometer cross trainer is no exception! 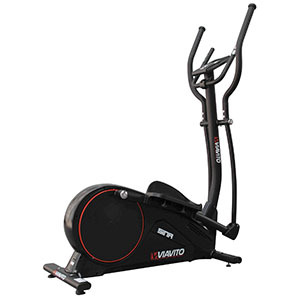 It’s undoubtedly a nice looking bit of kit however, the rear wheel design and rather slim frame may make the price of around £1500 seem a bit steep (even for such German quality)…But to draw that conclusion from a mere glance of the machine and the price tag, would do Kettler a disservice – there is A LOT more to this cross trainer than meets the eye! The real clue is in the title ‘Ergometer’. This means that above all else, this machine is a finely tuned, fitness tool for measuring your performance and giving you highly accurate feedback of your training data. To give you an indication of just how ‘finely tuned’ we are talking – the Unix E has 79 stages of resistance! So from ‘easy peasy’ to ‘tough enough’, not only does this machine offer huge scope for challenges and progression, it also means that increments of adjustment can be tiny and gradual, which is perfect for injury rehabilitation too. To further aid injury repair or prevention is the unique pedal motion. You won’t see this design on any other brand as it has been exclusively patented by Kettler under the name ‘extended motion’. The concept allows for a larger stride length (approx 20”) to be possible on a machine with a compact footprint. (This is the stride length that we’d normally expect on a machine that is at least 50 cm longer). 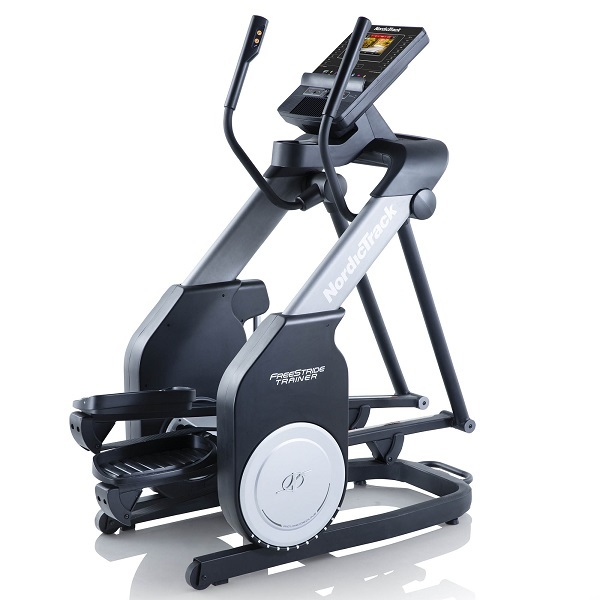 Thanks to a combination of a whopping 22kg flywheel and high quality bearings used in the construction of the machine, the pedals move with exquisite smoothness, traveling along chromed guide rails as well as revolving in an elliptical arc. 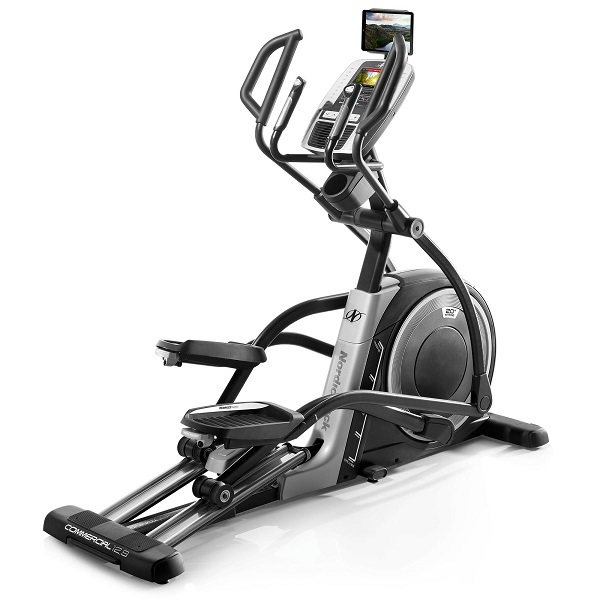 It’s superbly thought out with biomechanical precision BUT the resulting motion gives a unique and shallow movement that will certainly appeal to users with sensitive joints but maybe not be so widely appreciated by fans of the traditional oval elliptical movement. 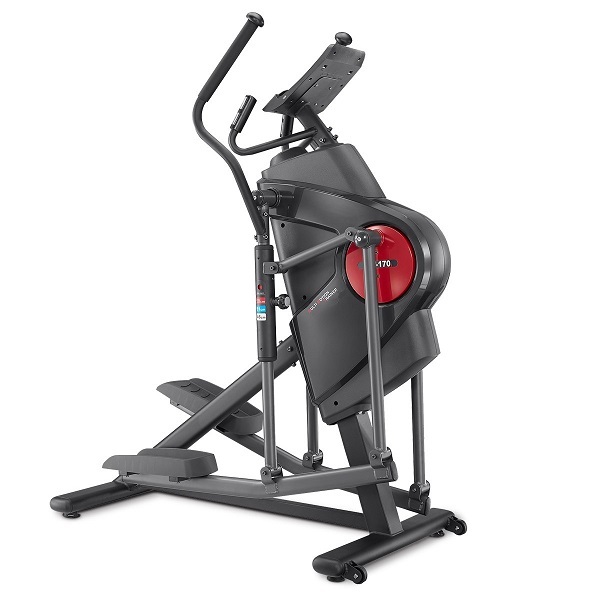 The Unix E is more comparable to skating rather than cross training BUT nonetheless, the feel is superbly fluid, comfortable AND effective for muscle toning. 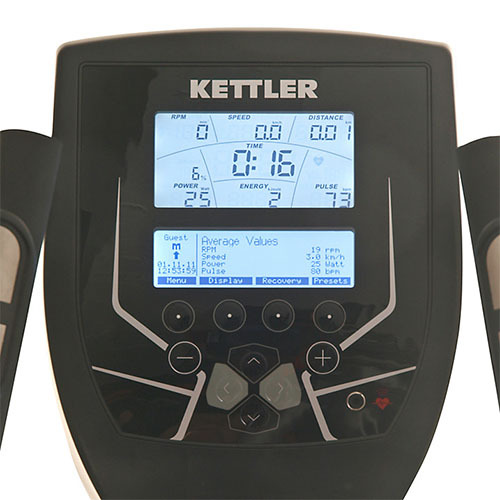 Although Kettler truly deserves full marks for design and ingenuity, we feel that the frame would have benefitted from being ‘beefed up’ a bit, which would have eradicated the slight bit of flex that we noticed during rigorous use. That said, the maximum user weight of over 23 stone, backed up by a 6 year parts and labour warranty shows on paper that the Unix E appears to be built to cope with ‘heavyweight’ workouts! 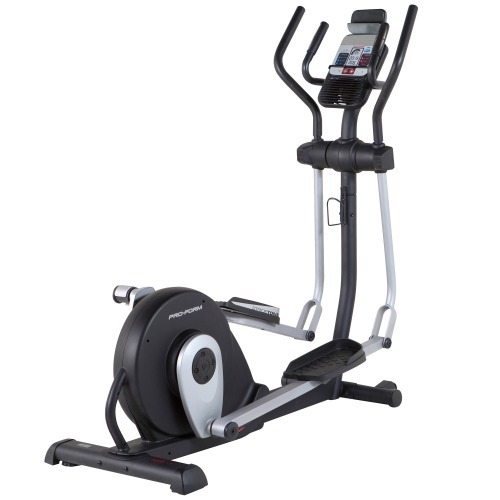 Aside from smoothness and feel of the stride action, the console is another important factor of a cross trainers usability. It’s fair to say that in this case, the console does an incredible amount of ‘clever’ stuff BUT as with most comprehensive software systems, it does require some time spent in learning it’s full capabilities. Siemens and KETTLER have got their heads together on the design and it’s clear that a lot of thought, research and science have gone into it! From the home screen you can select from one of the 4 preset users or start as a guest user. 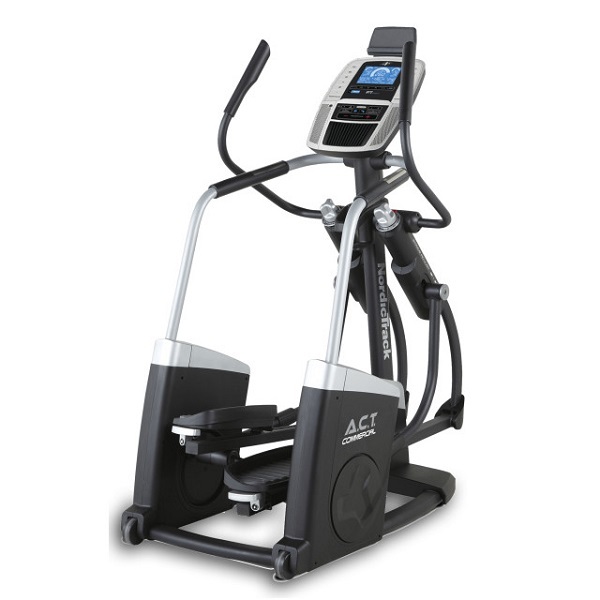 As a preset user you can input basic data like age and weight which allows the machine to calculate the users BMI and will provide more accurate calorie and heart rate targets and percentages. There are a number of preset programmes which include target pulse, max pulse, fat burn, a warm up and warm down, heart rate zones, pulse alarm, fitness programme and target manual entry. The simplest program is of course, the Manual mode, which allows you to enter the time, distance and resistance you wish to work at. For more variety there’s a good selection of Preset programmes. ‘Power fixed’ has 10 courses that range in time from 30 minutes at 6km going up to 90 minutes at 18 km. Each programme gives you a course profile and allows you to alter the workout time. ‘Individual’ has the same courses as ‘power fixed’ presets but with the option of editing the time, resistance and distance you wish to complete in the workout. The Unix E comes with a Polar chest belt included and this allows you to utilise the fabulous array of Heart rate controlled programs. Once again, the simplest of which is the Manual setting that allows you to set the heart rate you wish to work at and the machine will alter the resistance to keep you there. ‘Heart rate fixed’ has 5 programmes ranging in time from 30-90 minutes (although the programme sets a workout length, it can be increased once the programme has started by using the console keys ). The machine will set the heart rate at 80% as standard but this can also be altered before you start the programme. ‘Heart rate individual’ has 3 sessions each at 90 min where you can select heart rate and distance and again, the length of the session can be altered during the workout, so you can manually reduce the time down to a minimum of 20 minutes. There are 2 ways of using watts control. By selecting ‘Power count up’ the machine to take you up to your starting preset power level (the watts output) and keep you on target for the duration of the session. Alternatively by selecting the count down option, the machine will reach the top power level before taking you back down to the starting level (rather like a cool down). The display shows you the wattage you need to be putting out along with what your current output is, so all you have to do is match the two outputs. If you’re looking for a ‘plug and play’ type of machine, then this is not for you. In fact, there are little/no ‘play’ features for your entertainment. There’s no fan, no speakers, no MP3 jack plug…not even a drinks bottle holder. As you would expect, all the basics are present, such as levelling feet, front transport wheels, pulse grip sensors on the static handles and a tilting console for clear viewing of the dual screen display, but all in all these are JUST the features needed for pure performance. If you’re serious about your training and the accuracy of the feedback you get back from it, then this machine has been designed for you in mind. It’s possible to adjust almost every facet of your sessions BUT it does it in the most unintuitive of ways! 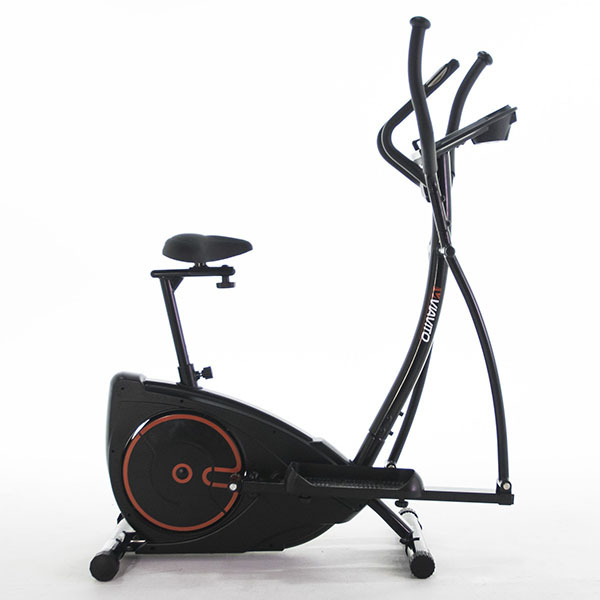 So if you have the patience and the inclination to read the manual and take the time to tailor the programmes, the Unix E Ergometer will give plenty back. 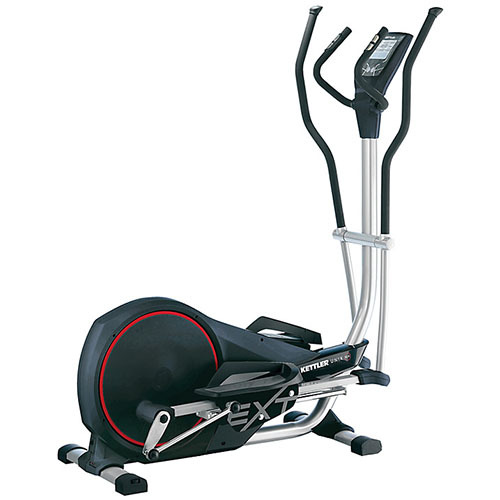 The Kettler Unix E is not currently available from any retailers we're aware of in the UK. Resistance measurement ranging from 0 – 400 watts in 5 watt steps. 48 programs including (HRC) Heart rate light system. Visual and audible alarm when exceeding max pulse rate. Records training. The console is as complex as it is comprehensive!